Happy New Year! We are two and a half weeks into 2019, and the question, of course, is how we are all doing with any resolutions we’ve made. As someone who does not make resolutions in January, I am fascinated by people who do. I understand how and why the beginning of a new year prompts us to “want to do better”. What I don’t understand is why folks want to start in the dead of winter when it’s dark and cold, and we are too depressed to sustain changes (for those of us who live in the northeast part of the United States, that is!). I spoke with a friend recently who had decided she’d incorporate walking every morning as a new routine. The problem, of course, is that after the first two days, the weather became frigid, and the sidewalks were too icy, and she didn’t want to leave the comfort of her warm bed. As we chatted, I suggested that maybe she needed to make an attainable goal for herself instead, like occasional outdoor afternoon walks, weather permitting, which supplement indoor exercise, maybe a home video or taking a class at a gym once or twice a week. Too often, the reason we cannot sustain New Year’s resolutions is simply that they’re too lofty. I counsel folks in my baking workshops to make little changes, one at a time, which over extended time become habits and lead to overall better healthy eating in the long run, as opposed to changing everything at once and finding it to be too overwhelming and unsustainable. 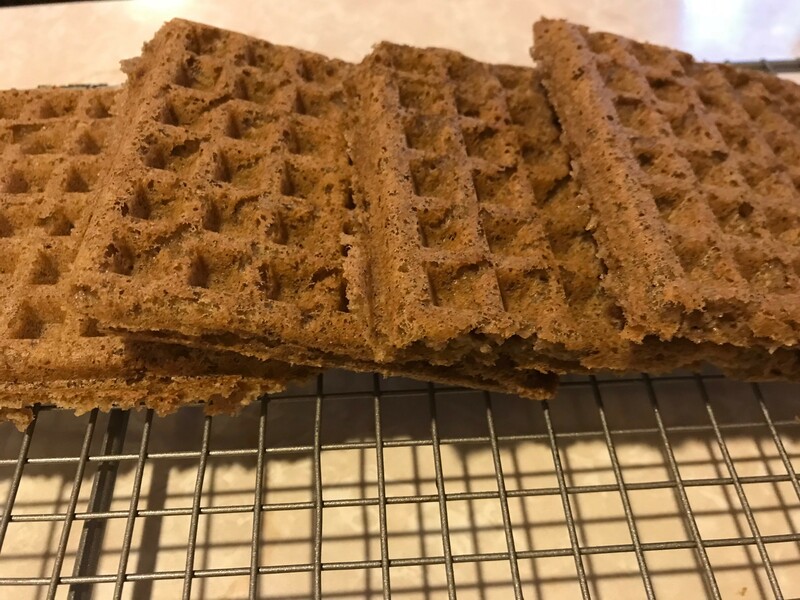 So, in that vein, the next few posts will simply be some healthy recipes which folks can incorporate as you choose into your diet, and today’s recipe is for a vegan protein waffle. Homemade waffles are great because you can control what goes into them. Since waffles can be full of carbs, though, I wanted to find a way to add some protein. Also, with so many folks going vegan these days or having food allergies, I wanted waffles which most anyone could eat. We had them as a family last weekend, and they were delicious! Prepare and preheat your waffle maker as instructed. Mix together in a large bowl the GF flour, ground flaxseed, protein powder, egg replacer powder, baking powder, cinnamon, baking soda and salt. Set aside. Whisk the milk with the lemon juice, and set aside. Mix together the oil, maple syrup and water. Add to the milk mixture. Pour the liquid ingredients into the dry and add the vinegar. Whisk well until all the dry ingredients are fully incorporated. Cook waffles in your waffle maker as instructed. NOTE: My niece told me that every time she tried to make vegan waffles they stuck to the waffle maker. I had no such issues with either of my waffle makers when we made these waffles. If you find that the waffles stick, it may simply be that your waffle maker has not been “seasoned” enough. Brushing the waffle maker with oil or spraying it with a non-propellant olive oil spray, as I do, tends to work.